Devotee: I was just wondering, if the spirit soul being in the spiritual world is eternally liberated, how can he return? By desire? Prabhupāda: Yes. If he desires, he can come again. That option is always there. Just like I remain in India; I come here. And if I like, I may not come. It is my option. Devotee (2): When we get to the spiritual sky, we'll always be able to remember how horrible it is down here, huh? We'll always be able to remember how terrible it is in the material world? Devotee (2): Yes, we will be able to remember that. 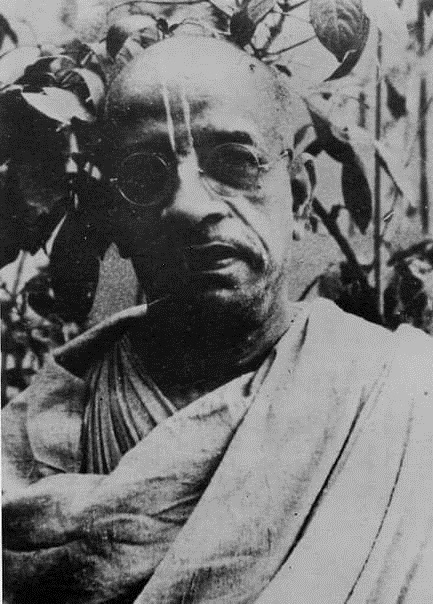 Prabhupāda: That is intelligence. When one remembers that this world is duḥkhālayam aśāśvatam (BG 8.15), is a place of misery, then we can go. As long as we shall think, "Oh, it is very nice place," we'll have to remain here. Kṛṣṇa is so kind, "All right, remain in this very nice place." Devotee (3): You gave the example yesterday of Lord Indra. When he took birth here as a hog, then he didn't want to leave. He thought it was nice. Prabhupāda: Yes, he also thought it is a very nice place. Devotee (4): Queen Kuntī was always praying that the calamities would happen again and again so that she would remember Kṛṣṇa. If the calamities are always happening in the material world, we will realize it is a terrible place to stay. Devotee (5): They say that without the bad, then the good wouldn't be as good. Prabhupāda: So you remain with bad and good. Sometimes good, sometimes bad. That possibility is here. Sometimes you are going to the higher, heavenly planets, a long duration of life, better standard of enjoyment—again coming back. (break) Good and bad is exemplified: just like I catch you and put down the water, and when you are suffocated, I raise you little, and you say, "Ohhh. (laughter) It is very nice." But you do not know again you are going to be... You see? This "good," "bad," is here like that. He is put into the water and suffocated, and when he is taken out little, he says, "Oh, it is very good. It is very good." The rascal does not know the next moment he is going to be again drowned in that way. That is going on. Devotee (6): ...consciousness part of this life, up to the time of death, in our next life we will be put in a situation immediately where we can take up Kṛṣṇa consciousness again, or will we have to suffer karma before we came into Kṛṣṇa consciousness? Prabhupāda: You will get Kṛṣṇa conscious again. Yoga-bhraṣṭaḥ sañjāya... Śucīnāṁ śrīmatāṁ gehe yoga-bhraṣṭaḥ sañjāyate (BG 6.41). A Kṛṣṇa conscious person will be given all comforts of material life so that he may regain without any botheration. Devotee (7): Sometimes it is stated that Kṛṣṇa will take everything away from the devotee. Prabhupāda: That is special favor, (laughter) that "This rascal is again attached. Take all his..." That is special favor. That is not ordinary favor. So that when everything is taken away, he will completely surrender to Kṛṣṇa, "Kṛṣṇa, I have nothing except You." Tomā vine ke āche āmāra: "I have nothing." That is very good. Devotee (9): Yes, that option is always, because you are independent. Prabhupāda: Yes. That is special favor. Devotee (7): So Kṛṣṇa is directly controlling that? Prabhupāda: Yes. When He sees, "That fool wants Me, at the same time, material world. So take his material possession, everything, so that he will want only Me, that's all." Actually, it was done to me. (laughs) I have got practical experience. I did not want to take sannyāsa. I thought that I shall do business. And Kṛṣṇa forced me to take sannyāsa and all, everything, dismantled. Devotee (6): Kṛṣṇa's mercy on us.